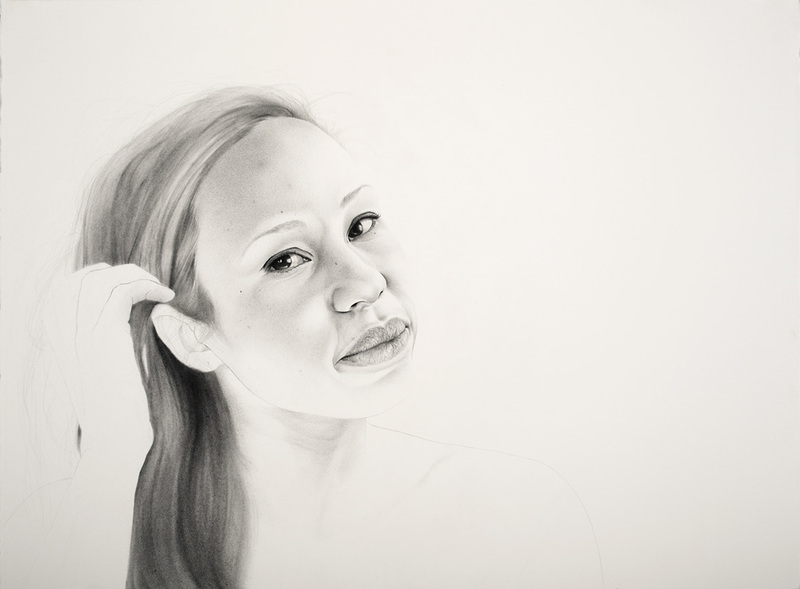 Ampersand is pleased to present indivisible, an exhibition of new drawings by Portland artist Samantha Wall. Much of the work was created in New Orleans during an artist residency at the Joan Mitchell Center, where Wall spent nearly a month meeting, photographing and talking with multiracial women. Like Wall, who was born in South Korea but raised in the U.S., the women were familiar with a space Wall felt she alone occupied, a space in-between her two ethnic identities. “Their recollections of poignant moments, marked by emotional significance, resonated with my own,” notes Wall. “I saw in them the aspects of myself that I have tried to obscure, and that allowed me to forge a connection that I had been eager to experience. But the photographs alone could never communicate the subjectivity of these individuals.” Choosing single frames from among thousands of possible photographic images, Wall has created drawings that express both the sensual virtuosity of her drawing style and the rich (and often ambiguous) expressive language condensed in a fleeting facial expression. “The act of drawing is seeing,” declares Wall, “not merely the creation of lines that articulate the curve of a jaw or the turn of a lip. It is a quiet and contemplative vision; the more I look, the more is revealed to me. Each mark in the act of drawing contributes to the expression of a distinct feeling. Drawing from photographs requires that I translate the monocular vision of the camera’s eye into the experiential vision of the body." Samantha Wall was born in 1977 in Seoul, South Korea. She currently lives and works in Portland, Oregon. Her work has been widely exhibited, most recently at the Art Gym at Marylhurst University, and in group shows at Laura Russo Gallery and the CUE Art Foundation in New York. She is the recipient of awards and honors from the Regional Arts Council, Oregon Arts Commission, Joan Mitchell Foundation and PNCA. Ampersand has designed and published a book to coincide with the exhibition. Also titled indivisble, this small edition publication features Wall's most recent drawings alongside expansive grids of photographs that have been faintly obscured and purposely reduced in size. This conceptual look at Wall's working process emphasizes the relationship between the photographs and video stills Wall made during extensive interviews with multiracial women and the singular drawings that emerged from the process. Published in an edition of 100, the book will be released at the opening and Wall will be signing copies. Ten deluxe copies are signed and include an original small drawing by the artist. © 2013 Samantha Wall & Ampersand. All Rights Reserved.